Can I Give Thanks for That? “Lara” has every reason to be angry. Her year stunk. But, she’s not mad. In fact, she’s not even disappointed. This is why she’s a model when it comes to giving thanks. Lara embraces the elements of life typically seen as barriers to joy. She’s working on something bigger than getting to the top of the org chart, and the difficult situations, people and the events that would disappoint most elevate her. This could be labeled “the year of cancer” for Lara. Her response? She celebrates a deeper appreciation of health. Lara also works with a few “tough” colleagues who can’t seem to function with accountability. Lara’s view of it all? They strengthen her resolve to act from her values unconditionally. Endless workdays? They drive a grace and gratitude for fleeting moments with family. Too often I can stumble and get lost in the pain and disappointment of not getting to where I want to go fast enough. Lara? She sees value in everything and therefore benefits from increased strength, wisdom and joy – her measurements of a life well lived. Can I be thankful for those who anger me? 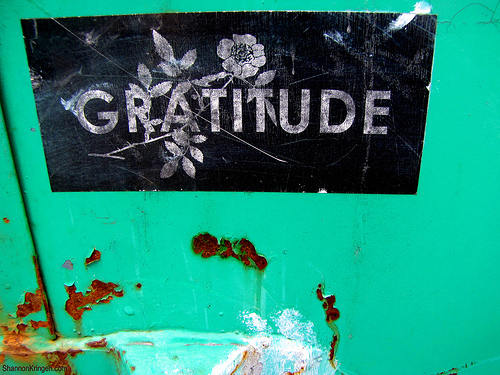 Can I express gratitude for the disappointments that pile up over the course of a year? I appreciate this post and find I must learn this lesson over and over. Recently, I had a wonderful opportunity to develop myself and it came from being bullied at work. I knew that vacillating between anger and victimhood wasn’t helping anything, but it took some serious time and effort to move from those positions. Focusing on the Buddhist concept of changing poison to medicine, though, I worked through it. Through prayer and meditation and dialogue with great friends and mentors, I gradually reached a better place where I appreciated that even that bullying behavior likely came from a place of concern that I could appreciate. I found a place within me that wanted everyone in the situation to win, and I believe we all did. How those relationships at work will ultimately resolve is not completely in my control; but how I show up is. I will continue working to be my best and to confront such challenges head on. My bet is that, one way or another, such challenges will diminish. Thank you for contributing, Ginny. Your thoughts regarding what we can control and keeping our focus there resonates. This timely post on giving thanks makes me think about thanks’s cousin forgiveness. When we forgive a person or situation we not only forgive outwardly but we release an inward burden that frees us up to more positive, forward thinking and optomistic. Some of the greatest gifts we can give ourselves are the ability to remain thankful and the capacity to forgive. Sound wisdom, Cadmus! “Thank’s cousin – forgiveness.” That works.